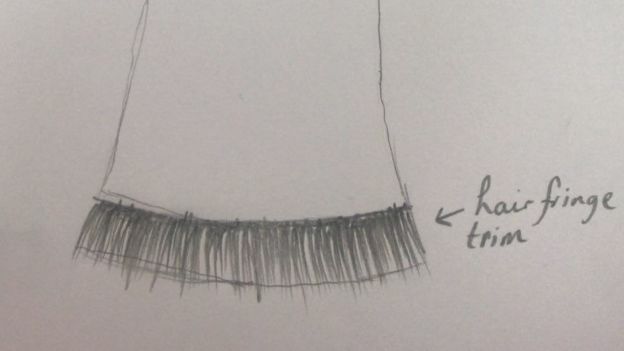 A woman is searching for a dressmaker who can create a garment featuring her dead mother's hair. She says she had been collecting the hair for four years before her mother died in August and will pay £15k for a replica of her mother's wedding dress. The 61-year-old from Bristol, who wants to remain anonymous, posted the request on the fashion manufacturing website Sewport. So far, no designer has volunteered to take on the task. In her post, the woman writes: "I'm looking for someone to recreate my mother's wedding dress from 1953, which she wore when she married my father. "My mother passed away recently and I'd like to create a special memento of her life. She wrote: "I found out my mother was ill in 2014 and from that point onward I began to collect her hair. "At the time I wasn't sure why I was collecting it, however, now I think I do." She acknowledges the task is "admittedly quite weird" but says she is keen to have the finished piece ready in time for the anniversary of her mother's death next August. It was usual for Victorian mourners to wear lockets and rings containing a lock of hair from a dead person. Queen Victoria is said to have regularly worn a locket of Prince Albert's hair from his death in 1861, up until her own 40 years later. The preparation of hair for mourning jewellery was a professional occupation in the 19th Century. At the same time in the US there was a trend for making wreaths out of loved ones' hair. Wreaths intertwining the hair of dead and living relatives were viewed as objects to signify the family tree. Details of how to shape and create a hair wreath are included in the Self-Instructor in the Art of Hair Work published in 1867, and a catalogue from the National Artistic Hairwork Company. Leila Cohoon's Hair Museum in Independence, Missouri, displays more than 400 wreaths and more than 2,000 pieces of jewellery made out of human hair. The ideal design she says, would feature hair sewn into the sleeves, trim, collar and bodice of the ballroom-style dress. 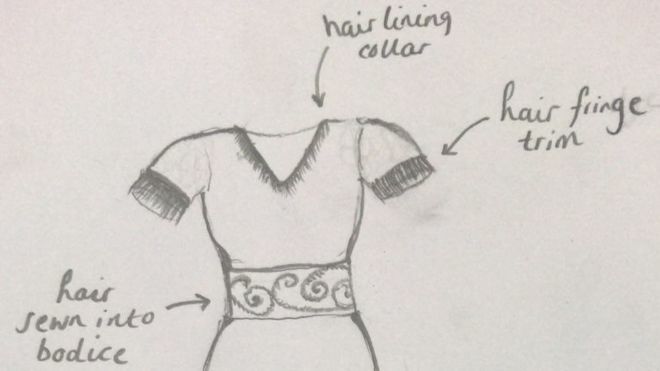 She has sketched out a design and says she would like it to be as "authentic" as possible and feature the box of hair she started collecting in 2014. Boris Hodakel, founder of the Sewport website, said most design requests were typically snapped up by manufacturers within six hours. He said: "We deal with quirky and wonderful designs every day - that's fashion." Not so weird as you might think. There are some strange ideas out there, many unusual ways that some people have of turning their deceased loved one's ashes and personal items into unique memorials. Brin wrote: Not so weird as you might think. There are some strange ideas out there, many unusual ways that some people have of turning their deceased loved one's ashes and personal items into unique memorials. The Vatican published guidelines on Tuesday for Catholics who want to be cremated, saying their remains cannot be scattered, divvied up or kept at home, but should be stored in a sacred, church-approved place. For most of its 2,000-year history, the Catholic Church only permitted burial, arguing it best expressed the Christian hope of resurrection. But in 1963, the Vatican explicitly allowed cremation as long as it didn't suggest a denial of faith about resurrection. The new document from the Vatican's Congregation for the Doctrine of the Faith repeats that burial remains preferred, with officials calling cremation a "brutal destruction" of the body. But it lays out guidelines for conserving ashes for the increasing number of Catholics who choose cremation for economic, ecological or other reasons. It said it was doing so to counter what it called "new ideas contrary to the church's faith" that had emerged since 1963, including the new-age concept that death is a "fusion" with Mother Nature and the universe, or the "definitive liberation" from the prison of the body. To set the faithful straight, the Vatican said ashes and bone fragments cannot be kept at home, since it would deprive the Christian community as a whole of remembering the dead. Rather, church authorities should designate a sacred place, such as a cemetery or church area, to hold them. Only in extraordinary cases can a bishop allow ashes to be kept at home, it said. The dead body isn't the private property of relatives. It repeated church teaching that Catholics who choose to be cremated for reasons contrary to the Christian faith must be denied a Christian funeral. The new instruction carries an Aug. 15 date and says Pope Francis approved it March 18. The author of the text, Cardinal Gerhard Mueller, was asked at a Vatican briefing if Francis had any reservations about the text, particularly the refusal to let family members keep remains of their loved ones at home. In the small village where I grew up in Ireland there were two cemeteries just outside either end of the village; one large one (Catholic), and the smaller one (Protestant) at the other end. The Protestant graveyard was said to be haunted by the troubled ghost of a Catholic person buried there - having been denied a Catholic burial because they had committed some terrible sin (never did find out what that was supposed to have been).